4.6 out of 5 based on 154 bloggers and 41 commenters. 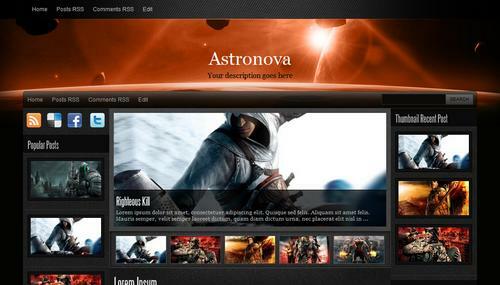 Astronova is a free blogger template adapted from WordPress with 3 columns, magazine-styled, left and right sidebars, slider and posts thumbnails. This template is not convert by PBTemplates. This template is convert by Best Theme. please check it. @Best Theme / Vk bhardwaj: Sorry! There are two versions of this template: one created by PBTemplates and one from Best Themes. The template author was changed. hey. i setup this theme. but pls someone help me. cos ı dont know how can ı chance middle of site slayt pics. for example ı wana make it my last topic appear there. ı hope ı could explain my mean..
How do I make the slider appear ONLY on the homepage? @Claudia: Thanks for the quick reply but I put the code under ]]> but it still shows on post pages as well. I want it only on the homepage. It should disappear when it goes on a post but it doesn’t. Thnx for quick reply. No it did not work…still appearing on homepage, and posts. I want it to ONLY appear on homepage. Please Help, thanks! @GeorgeEngineer: Sorry, the code was wrong. Modify the code again. It should work now. can u help us with this ? GOOGLE CHROME DEFORMS THIS LAYOUT!… And when I say ‘deforms’, I’m referring to the Recent Posts list. Is there a way to fix this? I have a problem with displaying the headers using russian letters. Any text in russian doesn’t appear at all. Can you help me? Thanks. Great template. I’m using it in my blog but I now have a problem. Sinde I installed the template my feed is acompletely messed up. Anyone got the same problem? Any fixes? Excellent template, I really liked. The language of my blog is Portuguese of Brazil, when I put accents or special characters, these do not appear in the title of the post. I wonder if it has how to fix this problem? Hey claudia….i installed this great template…as i know a little html…so i was manage to edit the moving bars and few other minor changes…but i still am not able to figure out something….In the recent posts on the right hand side….there is a problem with the thumbnails…also this problem is appearing for the homepage…where some of my posts are dont have thumbnails…is there any option i can include thumbnails externally???. If you can help me…I want to remove that “thumbnail recent post” sidebar…. If you didni’t find the code, click on the “Expand widget templates” box and search again. Hey!! Hi Claudia, acctually, i’m moving my blog from wordpress to blogger and i like this template!! But i have a problem when i use special characters, such as: ú, ó, ç. This problem is only in the post titles and in the slideshow. Hi, this isn’t a major problem, but the text color under “Leave A Reply” matches the background color too closely (it looks black or very dark gray). So it’s difficult to read. I haven’t been able to fix it. Help! Hi claudia i am newbie in blogspot. i like this template, i want to use it but i want change all the picture in this template. I want to ask how to change the picture with the other one? thanx 1st, hope u can help me? (Spanish) No es una plantilla fácil de manejar por lo que el público poco dado a la modificación de html encontrará bastantes dificultades. Aconsejo trabajar con 2 pestañas: en 1 de ellas copiaremos la ruta de enlace de cada 1 de las fotografías, en la 2º pestaña tendremos el codigo html preparado, ejecutaremos la busqueda de la fotografia y una vez encontrada ya podremos cambiarla sin miedo. Por el resto salvo que la exportación de texto de word a blog no es la mejor, es una plantilla que visualmente ofrece un gran poder llamativo. how can I put a Dropdown menu..? I mean like CATEGORY–>Child Category–> sub child Category..
please help me..I really like this theme..
Hi. I use this theme and am having some trouble having it show my twitter feed. I have edited the PHP and believe I done this right as it was working but has stopped showing my feed now. Any help with this would be great. how do i make the post background white in colour??? Tengo un problema como cambio las imagenes que se mueven las puedo cambiar pero lo malo es como pongo el url de la publicacion para que le declick ala imagen . Please help me out, the queistion is how do i change the Those phiture? Please help me out, the queistion is how do i change the Those phiture that’s on my homepage? plz help me out ……………. how to remove the center slider, the reason is lot of time for loading so plz help me as soon as posibile. hello claudia if i may bother you how would i change the featured slider pictures? hello claudia if i may bother you how could i change the featured slider pictures?